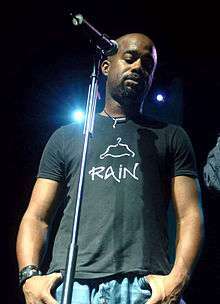 Darius Carlos Rucker (born May 13, 1966) is an American singer and songwriter. He first gained fame as the lead vocalist and rhythm guitarist of the Grammy Award-winning American rock band Hootie & the Blowfish, which he founded in 1986 at the University of South Carolina along with Mark Bryan, Jim "Soni" Sonefeld and Dean Felber. The band has released five studio albums with him as a member, and charted six top 40 hits on the Billboard Hot 100. Rucker co-wrote the majority of the band's songs with the other three members. He released a solo R&B album, Back to Then, in 2002 on Hidden Beach Recordings but did not chart any singles from it. Six years later, Rucker signed to Capitol Nashville as a country music singer, releasing the album, Learn to Live that year. Its first single, "Don't Think I Don't Think About It", made him the first black artist to reach number one on the Hot Country Songs charts since Charley Pride in 1983. (Ray Charles hit number one in March 1985 in a duet with Willie Nelson with Seven Spanish Angels). It was followed by two more number one singles, "It Won't Be Like This for Long" and "Alright" and the number three, "History in the Making." In 2009, he became the first African American to win the New Artist Award from the Country Music Association, and only the second African American to win any award from the association. A second album, Charleston, SC 1966, was released on October 12, 2010. The album includes the number one singles, "Come Back Song" and "This". Rucker has been the lead singer of Hootie & the Blowfish since its formation in 1986. He met fellow band members, Mark Bryan, Jim "Soni" Sonefeld, and Dean Felber, while attending the University of South Carolina. Bryan heard Rucker singing in the shower, and the two became a duo, playing R.E.M. covers at a local venue. They later recruited Felber and finally Sonefeld joined in 1989. As a member of Hootie & the Blowfish, Rucker has recorded six studio albums: Cracked Rear View – 1994, Fairweather Johnson – 1996, Musical Chairs – 1998, Scattered, Smothered & Covered – 2000, Hootie & the Blowfish and Looking for Lucky – 2005, also charting within the top 40 of the Billboard Hot 100 six times. All six albums feature songs that Rucker, Bryan and Felber wrote. As the frontman, Rucker began to be called simply "Hootie" in the media, though the band title combines the nicknames of his college friends. Before his rise to fame, he lived in the basement of the Sigma Phi Epsilon house at the University of South Carolina, attempting to launch his career through the college bar scene. Rucker's signature contribution to the band is his baritone voice, which Rolling Stone has called "ingratiating," TIME has called "low, gruff, [and] charismatic," and Entertainment Weekly has characterized as a "barrelhouse growl." Rucker said they "flipped" the formula of the all black band with a white frontman, like Frank Sinatra performing with Count Basie. Musically, he has sometimes been criticized or spoofed for not being "black enough". Saturday Night Live ran a sketch of Tim Meadows playing Rucker leading beer-drinking, white fraternity members in a counter-march to Louis Farrakhan's Million Man March. He also received death threats for singing the Hootie song "Drowning," a protest song against the flying of the Confederate flag above the South Carolina statehouse. Shortly after gaining a measure of fame, Felber and Rucker (who consider themselves best friends) moved into an apartment in Columbia, South Carolina (Mikes roommate George Colclough moved in with them for a summer). With Rucker's recognition as the frontman of a successful band came increased opportunities. In October 1995, he was asked to sing the national anthem at the World Series. Frank Sinatra invited him to sing at his 80th birthday party; he sang "The Lady Is a Tramp." That same week, he made a voice cameo in an episode of the sitcom Friends. He also joined Nanci Griffith on the song "Gulf Coast Highway" for her 1997 album Blue Roses from the Moons, and sang backing vocals on Radney Foster's 1999 album See What You Want to See. He encouraged Atlantic Records to agree to a deal with Edwin McCain and made a guest appearance on McCain's debut album, Honor Among Thieves. On May 29, 2016, Rucker performed the national anthem prior to the 100th running of the Indianapolis 500. Rucker also performed the national anthem for a game between the Buffalo Bills and the New York Jets on September 15; although Rucker is a well-known Miami Dolphins fan, Rucker agreed to perform the song at the behest of personal friend and former Bills player Bruce Smith, whose jersey was being retired that night. He was selected as one of 30 artists to perform on "Forever Country", a mash-up track of Take Me Home, Country Roads, On the Road Again and I Will Always Love You which celebrates 50 years of the CMA Awards. In 2017, he will return to Europe as part of the C2C: Country to Country festival. 2011 CMT Music Awards CMT Performance of the Year "Need You Now"
2012 Country Music Association Awards Musical Event of the Year "Stuck on You"
↑ Leahey, Andrew. "Darius Rucker". Allmusic. Retrieved October 24, 2015. ↑ "Hootie & the Blowfish chart history". Allmusic. Retrieved 22 November 2010. ↑ See What You Want to See (CD insert). Radney Foster. Arista Records. 1998. 18833. 1 2 Moraski, Lauren (14 December 2011). "Darius Rucker to release new country album in early 2012". CBSnews. Retrieved 9 January 2012. 1 2 Wilson, MacKenzie. "Darius Rucker biography". Allmusic. Retrieved 2008-05-07. 1 2 Cordova, Randy. "10/15: Darius Rucker talks State Fair, Hootie reunion." The Arizona Republic. Oct. 15, 2014. ↑ Duncan, Apryl (2005-03-07). "Yes, that's Hootie crooning for Burger King. In 1999, he sang "War" at the Bob Marley All-Star Tribute.". About.com. Retrieved 2008-06-10. ↑ Taylor Jr., Otis R. (19 September 2008). "Hootie's Darius Rucker not just a rocker gone country". PopMatters. Retrieved 22 November 2010. ↑ "Darius Rucker Basking in Country Success". GAC. 2008-07-23. Retrieved 2008-08-24. ↑ C., Matt (2008-08-13). "Rucker Proves That Sometimes, The Best Marketing Is No Marketing At All". Engine 145. Retrieved 2008-08-24. ↑ Caulfield, Keith. "Metallica Holds At No. 1, Ne-Yo Arrives In Second ". Billboard. September 24, 2008. Retrieved 23 November 2010. ↑ Guerra, Joey (13 March 2009). "Darius Rucker thrilled to be living his dream". The Houston Chronicle. Retrieved 22 November 2010. ↑ "RIAA – Gold & Platinum". Recording Industry Association of America. Retrieved 2009-09-18. ↑ Trust, Gary (2009-08-05). "Chart Beat: Darius Rucker, Mariah Carey, Brad Paisley, Wilco". Billboard. Retrieved 2009-08-06. 1 2 "Darius Rucker Album & Song Chart History – Country Songs". Billboard. Retrieved September 14, 2010. 1 2 "Darius Rucker Album & Song Chart History – Hot 100". Billboard. Retrieved September 14, 2010. ↑ No byline (September 23, 2008), "Hootie's Rucker tops country chart". USA Today. ↑ Lapowsky, Issie (12 November 2009). "CMA's underdog: Darius Rucker of Hootie and the Blowfish, first black to win best new artist". NY Daily News. Retrieved 21 November 2010. ↑ "Darius Rucker shoots for country milestone". Msnbc.com. 11 November 2009. Retrieved 21 November 2010. ↑ "Darius Rucker Schedules New Album, Charleston, SC 1966, for Oct. 12". CMT. 16 July 2010. Retrieved 22 August 2010. ↑ Lawler, Joe (20 August 2010). "Rucker makes easy transition". Des Moines Register. Retrieved 22 August 2010. ↑ Shelburne, Craig (8 June 2010). "Darius Rucker Sings a Groovy "Come Back Song"". CMT. Retrieved 22 August 2010. ↑ Cheung, Nadine (8 November 2010). "Darius Rucker — "This"". AOL Radio Blog. Retrieved 21 November 2010. ↑ Erlewine, Stephen Thomas. "Charleston, SC 1966 review". Allmusic. Retrieved 27 September 2012. ↑ "Gold & Platinum Search". RIAA. Retrieved 2011-03-04. ↑ Hettiger, Laura (2011-05-20). "Darius Rucker celebrates MUSC's graduation". Retrieved 2015-05-23. ↑ "Broadway's Electric Barnyard". Broadwayselecttricbarnyard.com. Retrieved 2013-05-21. ↑ West, Kay (2013-01-14). "Brad Paisley Surprises Darius Rucker – with Grand Ole Opry Honor - Nashville, Music News, Brad Paisley, Darius Rucker". People.com. Retrieved 2013-05-21. ↑ Stefano, Angela (January 13, 2015). "Darius Rucker Reveals New Album Details, 2015 Southern Style Tour Plans". The Boot. Retrieved January 13, 2015. ↑ Hudak, Joseph (September 15, 2014). "Darius Rucker To Release Christmas Album". Rolling Stone. Retrieved September 22, 2014. ↑ Despres, Tricia. "Darius Rucker just turned in a stunning, Indy 500 rendition of "The Star Spangled Banner"". rare.us. Cox Media Group. Retrieved 29 May 2016. 1 2 Rovell, Darren (November 7, 2016). "Darius Rucker of Hootie and the Blowfish joins sports agency". ESPN.com. Retrieved November 7, 2016. Wikimedia Commons has media related to Darius Rucker.